Back in 2001, Damon Albarn was a pretty big deal. The songwriter and singer of Britpop sensation Blur, Albarn was the Gallagher brothers’ more pretentious cousin, even if his most famous bit of writing, “Song 2”, was originally intended to be a joke, poking fun at American grunge music. He was revered in Britain, but little more than an afterthought in the States. Britpop hadn’t fully crossed over to America, and so it seemed Albarn would be forever left in British consciousness. Then, on March 5, “Clint Eastwood” was released. With its jerky beat and faux-evil feel, “Clint Eastwood” was the world’s flashy introduction to Gorillaz, the Albarn side project which has long since eclipsed his own fame. And with Gorillaz, Albarn entered a new tier of respect in the music world: he went from solid pop singer to artistic master. As the popularity of Gorillaz continued to soar, Albarn seemed to get increasingly experimental, daring: he heavily used electronics, featured old-school rappers like De La Soul, and took the cartoon band to new heights that Blur, for all its British popularity, could never achieve. Just a few days ago, on March 23rd, this trend continued even further. In anticipation of the first Gorillaz album since 2011’s The Fall, titled Humanz, Gorillaz released four new tracks, all original and all very odd. “Saturnz Barz”, the flashiest of the new singles, was accompanied by a 360 degree music video and features Jamaican singer Popcaan heavily, recalls “Clint Eastwood” with its slow, drum-heavy groove. “Ascension”, featuring Vince Staples, is an incredibly fun and short romp, with Vince absolutely killing it throughout the track. “We Got the Power”, featuring Savages singer Jehnny Beth and, amusingly, Noel Gallagher, is a little cheesy in its universal “All you need is love” message, but Beth’s quavering vocals rescue the track from itself. Finally, “Andromeda” features American rapper D.R.A.M. and goes for a more relaxed, bass-heavy feel that contrasts nicely from the other tracks. They may not all be Albarn & Co.’s finest work, but they are all certainly worth a listen. Humanz is out on Parlophone on April 28th. Lunar New Year’s celebrations don’t typically include a ‘90s Britpop band announcing a new album at a Chinese restaurant in London. But that’s exactly what happened on the first day of the holiday this year, with Blur revealing the title of their eighth studio album, The Magic Whip, and sharing the first song from it, “Go Out.” So gong hei fat choy to all the Britpop fans out there, I guess. 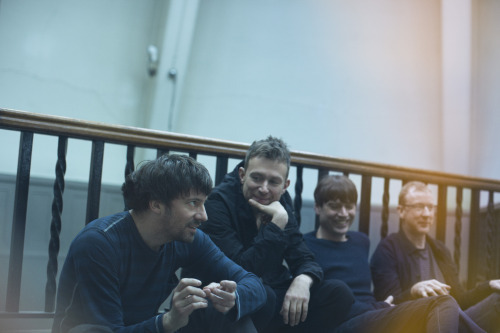 Hopes for new Blur album have been floating around since their reunion in 2009 and were further fueled by the release of a few new singles in the years since. Such hopes appeared to be confirmed with the news that the band recorded fifteen new songs during their 2013 Hong Kong tour, but singer Damon Albarn was quick to quash any overly optimistic thoughts by suggesting the sessions would end up as “one of those records that never comes out.” The members of the group seemed busy enough with other projects anyway, such as recording solo material, making cheese, and writing a musical based on Alice in Wonderland. Few were expecting the surprise announcement of The Magic Whip, including possibly Blur themselves. But after polishing up the Hong Kong tracks, the first Blur album in twelve years was ready to go, with the recording location inspiring its cover and announcement location. The first track to be revealed, “Go Out,” sounds in line with Blur’s later material. The noise of those post-Britpop albums is present here, though that’s not to say that there aren’t any hooks: the chorus, with its vocal hook, has already wriggled its way into my head. Meanwhile, Albarn’s contemptuous lyrics about “the greed go-getter con” show that he hasn’t grown too much more complacent with modern life since the ‘90s, when he sang about it was “rubbish.” On the whole, “Go Out” isn’t too wild of a departure for Blur, but that doesn’t mean we’ll be able to say that about the entire album. After all, Albarn has branched out quite a bit in his work with Gorillaz (and countless other projects), as has guitarist Graham Coxon with his own solo music. It’ll be interesting to see what other directions the band will take on The Magic Whip. In keeping with the Hong Kong theme, the lyric video for “Go Out” features gratuitous Chinese and, for some reason, an ice cream recipe. You could maybe try making it yourself while you wait for The Magic Whip to come out on April 29th, and you can pre-order it in your format of choice here.